NOTE: DUE TO GOING OVER CAPACITY WE HAVE LONG STOPPED TAKING BOOKINGS. Dress Code: smart casual. No tickets, names on the door. Fresh from our excellent annual conference in October, the TBG is pleased to announce the date for our Christmas social on December 15th. 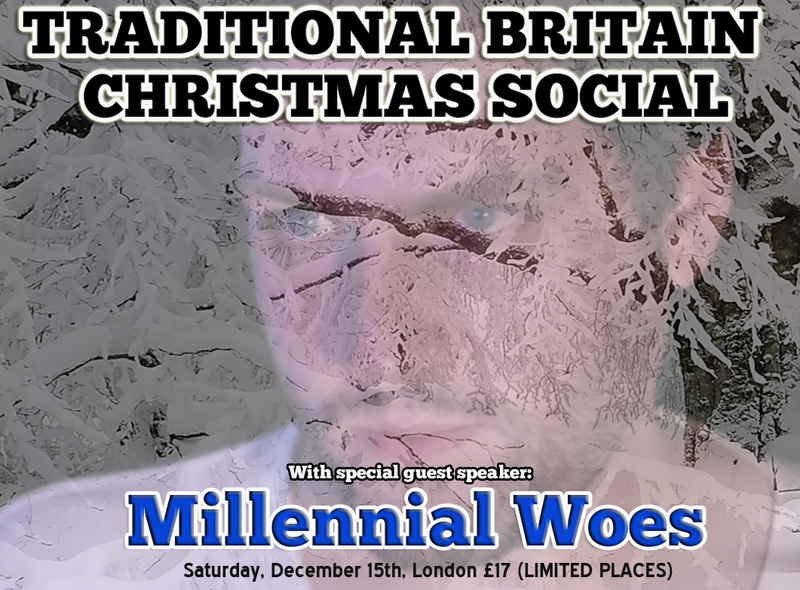 In line with our bringing you face to face with excellent representatives from across the right-of-centre spectrum, we're also very pleased to announce that the YouTube phenomenon Millennial Woes, will also join us and you will have a chance to listen to a speech and meet him there. Where: London hostelry conveniently located near to overland and Underground stations. What: An evening with your fellow upright traditionalist men and women and a speech by our guest, Millennial Woes. Tickets are priced at £17 and this secures the venue and a selection of general buffet-style finger food. Who: A maximum capacity of 60 places means that the evening will be intimate enough for you to meet all attendees, but with a wide range of people in attendance. If you're looking for an engaged and educated crowd of traditionalists, you will not find a better networking opportunity. Booking is open to all, although new attendees will be required to prove their identity for security purposes. As usual we reserve the right to ensure those who wish to attend are coming with the best intentions. How: See below, please select as appropriate. Note: Your booking confirms your agreement that you will not take nor share either electronic media from the event, nor details on the attendees publicly, preserving the privacy rights of attendees and not infringing the intellectual copyright of the event producers or speakers. We look forward to seeing a good many new and familiar faces at our Christmas drinks. Tickets? This is a non-ticketed event, with names on the door and attendees will be notified of the location the evening preceding (Friday). New attendees will be asked to provide ID before attendance to indicate their bona fides for the general security and harmony of the event.